I performed in the outdoor "entrance hall" of a gigantic elevator which, when operating, would take the miners down into the coal mine. The space was evocative and brought to mind the last moments before the miners were (as has always happened symbolically in history) carried down by the elevator cage. This may have been the moment when they stood for awhile and thought about their lives, hopes and dreams. I divided the hall using bungee cords, arranging them in a cross parallel to the floor. 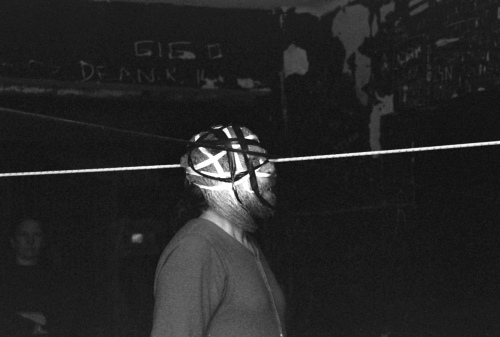 I then placed my blindfolded head into the space and performed the piece in six sequences. First I pushed the elastic cord up as much as possible referring to a desire of the workers to get help from spirituality. In the second, third, fourth,and fifth parts, I tested the maximum elasticity of the cords in four different cardinal points. And finally, using my head, swung the whole system of crossed cords down to the ground, referring to the repeating patterns of history.